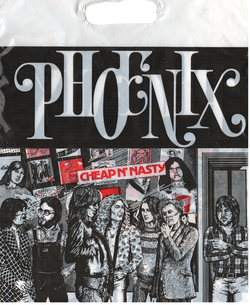 (April 21, 2015) Where Phoenix was metal, Sound Centre / Ripping was punk. This was the place to get your Crass or Dead Kennedys singles, or just to get lost in the vast upstairs collection of thousands of records you'd never heard of. Phoenix was indeed tiny, but a bit further down the Royal Mile - on the corner of Fleshmarket Close, across from the Tron. It was the favoured hangout for metalheads like myself - I remember queuing up to meet Ian Gillan in there, when there was literally no room to move. It was also famous for the acerbic hand-drawn comments and captions attached to record sleeves in the window.Comment: Richard Watt.